Maximum, four layer protection guards against static charges inside and out for total Faraday Cage protection. 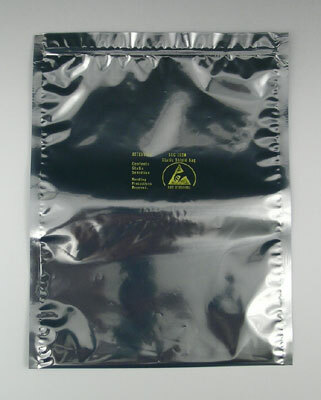 Polyester outer layer features a semi-conductive, static shielding coating. Non-shedding metallic middle layer provides an electrical transference barrier. Thick anti-static, polyethylene inner layer suppresses static inside the bag while resisting punctures and tears. Transparent for easy content identification. Zipper style is reusable. Preprinted with Electrostatic Sensitive Devices (ESD) message hot stamped in yellow. Usable dimensions are slightly smaller.